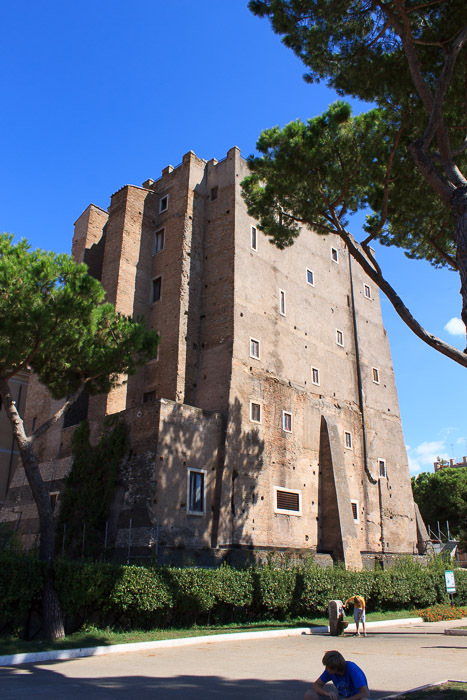 Torre dei Conti was once one of the most impressive medieval fortified towers in Rome. It was built as a very high (160-200 foot) tower on the ruins of a Roman temple in 1238 by Richard Conti, brother of Pope Innocent III, as a fortified residence for his family. The tower was originally covered in travertine salvaged from the ruins of the nearby Imperial Fora, but was in turn stripped for use in the Porta Pia designed by Michelangelo and built in the 16th century. The upper part of the tower collapsed in the earthquake of 1349 after which it was abandoned. The tower was further shortened by the collapse of its upper stories in the 17th century, resulting in its current 95-foot height. Repairs were effected at the end of the 17th century when two buttresses were added. 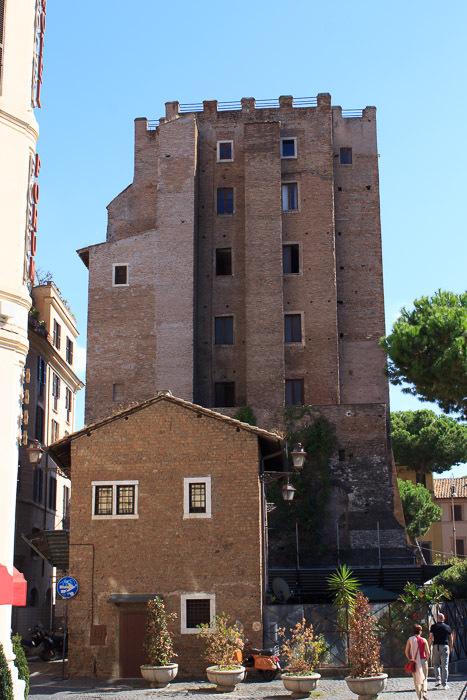 Today it appears as a rather short and squat tower, oddly placed at the end of a line of restaurants and hotels on Via Cavour, just before that street ends at Via dei Fori Imperiali. See all Torre dei Conti photos.